Tension Control Bolts, also called TC Bolts, A325 TC(ASTM F1852) or A490 TC(ASTM F2280) bolts, have an extension that is grooved (referred to as the spline) that is designed to ensure accurate, repeatable, and visible indication of proper tension levels with each installation. 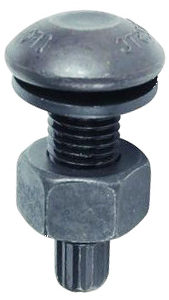 Tension control bolts have a button head as opposed to the hex head of regular structural bolts and always come as an assembly with a nut and washer. They require an electric shear wrench to install. To achieve the correct tension, the wrench turns the nut clockwise, while turning the spline counterclockwise. When the right tension level is reached the spline snaps off – giving consistent, repeatable, and visual indication of accurate tension levels. We stock many other sizes and can get any size that we don’t have in stock. Atlantic Bolt also has material test reports (MTRs) on file digitally for all our structural bolts. 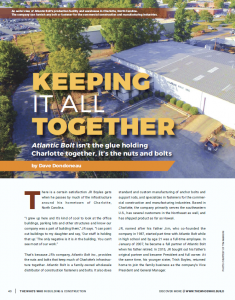 Atlantic Bolt is a wholesale distributor of fasteners and custom concrete anchor bolts in Charlotte, NC. Founded in 1987, we specialize in fasteners for the commercial construction and manufacturing industries. Copyright 2019 | All Rights Reserved | Atlantic Bolt Inc.